Jet Black 2003 BMW 330Ci Sport Convertible. 6 cyl. automatic, perfect Black canvas power top. Dove Gray leather interior, beautiful woodgrain accents, fully loaded, keyless remote entry key fob, power top, power seats with memory, fog lights, power windows, power head rests, power locks, mirrors, tilt, cruise, AM FM CD Stereo, and ice cold A/C. Factory alloy BMW Sport wheels. Runs and performs absolutely perfect! No rust, clean title. Mechanical inspection invited. BETTER CARS AT LOWER PRICES EVERY DAY! A+ RATING AT THE BETTER BUSINESS BUREAU! 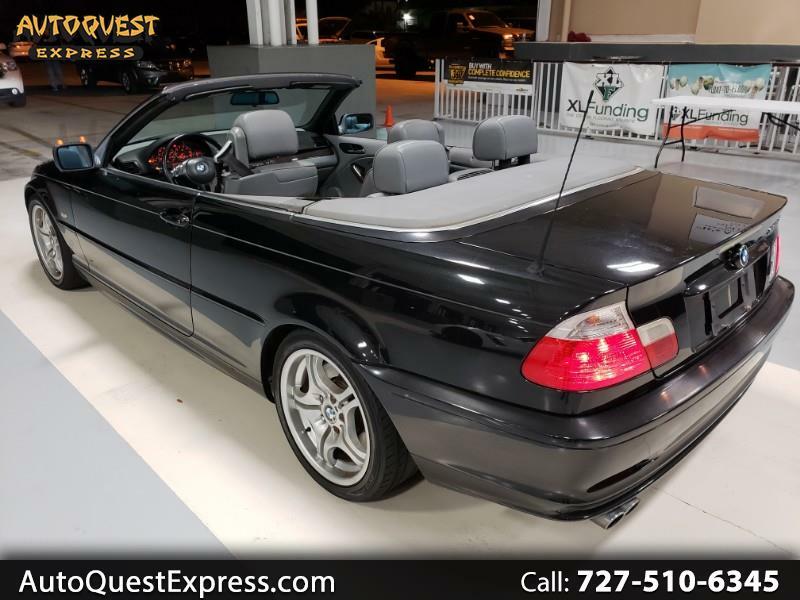 Visit Autoquest Express, LLC online at autoquestexpress.com to see more pictures of this vehicle or call us at 727-510-6345 today to schedule your test drive.